Whatever happened to "Don't trust anyone over 30"? D.C.'s quintesstial underground music venue hits the big three-oh this weekend, and they're celebrating with a relatively rare seated show on Sunday, followed by a free event Monday. 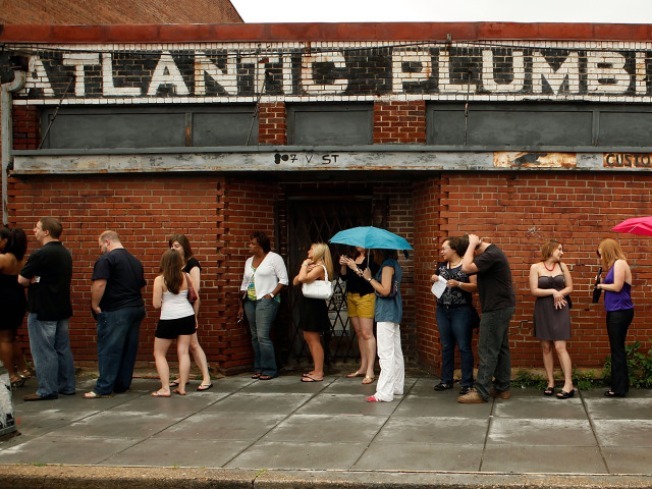 We know, we know, the joy at the 9:30 Club isn't solely about their amped-up sound system, downstairs bar or the fact that they now sell cupcakes -- although none of those things really hurt their case. It's all about cramming yourself in along the balconies or down on the floor among people who are probably government workers and lawyers by day, who've come out to see a great show and use restrooms with glassed-in Barbie and Ken dolls on the doors. What's not to love? The actual anniversary part of the weekend comes from a name change. The venue takes its title from its original address, 930 F St. N.W. -- but back in the 1970s, it was known as the Atlantis Club. It reopened as the 9:30 Club in 1980. Although in 1996 its official name changed to Nightclub 9:30, when was the last time you ever heard someone call it that? Yeah, never. Sunday's anniversary concert (6:30 p.m.; $40) features Richard Cheese & Lounge Against the Machine -- expect tongue-in-cheek "lounge" versions of hits from the past 30 years. Monday's anniversary concert, hosted by Henry Rollins, is free to some lucky, lucky winners. We Love D.C. has a partial list of performers, including Ted Leo, the Pietasters and the Psychedelic Furs, the first big act ever booked at the 9:30 Club. Attendees were selected by an online lottery.